Does Kanye West Really Have Diamond Teeth? OMG, Does Kanye West really have diamond teeth…thats what he said…but is it a joke? I have no idea why someone would do that! Kanye West is not only sporting a new friendly attitude as he tries to win back the public post Swift-gate; heâ€™s also sporting a new smile. The rapper showed up to Rodarte on Tuesday (â€œItâ€™s art,â€ he said of the collection) with thousands of dollars worth of gemstones in his mouth. â€œI removed my bottom row of teeth and I put diamonds in instead,â€ West said, adding that the work was done by a dentist in Hawaii but he couldnâ€™t remember which jeweler provided the ice. Oh No, Taylor Armstrong’s Husband Commits Suicide! Zayn Malik Says He’s Not In Touch With One Direction Members! Drake On Meek Mill: “Don’t Worry, He’s Dead Already!” Ouch! 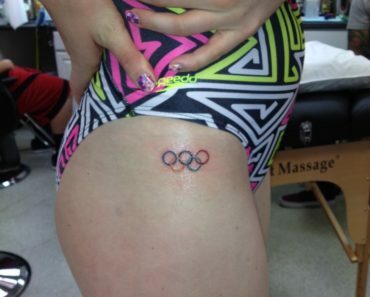 Olympian Missy Franklin Shows Off New Tattoo! !